Pat Holly came to our guild for the March meeting. I have already posted pictures from that night in an earlier blog. What I did not include at the time was pictures of her newest quilt as she was taking it to PADUCAH for the big quilt show. While at the guild she talked about her earlier works. At the time she gave me permission to post a picture on this blog of her quilts including the her newest quilt. So here they are. Just think this little quilt is less than 18 inches by 18 inches. Pat explained one of the characteristics of a miniature quilt is that it is proportional in scale. They should look like a large quilt when photographed. Pat won the Benartex Best Miniature Award for the quilt she called, Tiny Tigers 2. TINY TIGERS one is a gift for her daughter. Pat says she now makes two quilts at the same time as it is easier and allows her to experiment with the projects. Here are the pictures of Pat’s winning quilt. HERE is a video of Pat Holly at Paducha on YOU Tube. Be sure to sign up to the YOU Tube Channel. AQS has been posting new video interviews every day of Quilt Show. NONNIE has been very bad !!! NONNIE has been very BAD!! Because we just bought a new wood floor and had it installed, I have been trying to be more frugal and not buy every quilt book I have wanted. I did good for three months then last night in a fit of insomnia I came across the QUILT with the STARS at the Fons and Porter web site. I watched the interviews with Lynne Hagmeier of KANSAS TROUBLE QUILTERS. I fell in love with Lynne’s new layering instead of piecing technique she uses with layer cakes ( 10 in,) charm squares ( 5in,) and various Jelly Rolls ( 2.5inch) She is finding way to use all the pre cuts in an interesting way. First of all I would say this is a bonanza technique for quilt shop owners and Moda… I foresee them selling more precuts. I also think this will be a versatile technique that will explode in the future into all kinds of new patterns. This technique and several new patterns are laid out in Lynne’s new book, LOOSE CHANGE. What I like about the technique is that it is fast and easy allowing me to make new quilt tops faster with less work on my part. 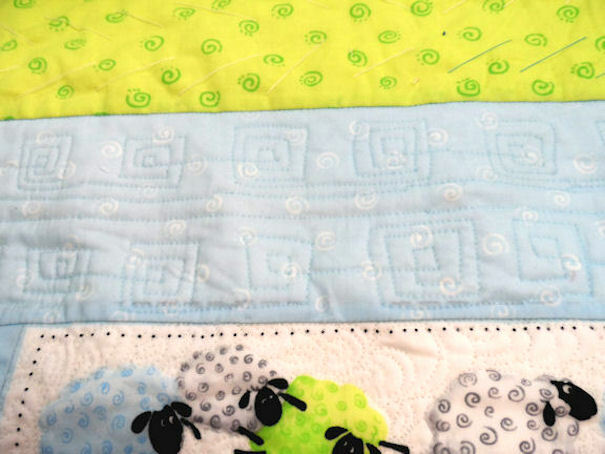 I loved every quilt in this book and see myself making several of them for baby gifts. The only drawback I see is that lack of pre cuts because I am on a fabric diet but I see myself cutting and using patches from my fat quarter stash. Yes, it will add work but I can get 10 inches and 5inch patches easily from my fat quarter collection. I can then make my own coordination and kits for these quilts. I will be posting the blocks / quilts as I go along. Not much progress on my FMQ as this weekend just flew by with family activities. I did wave to my sewing machine a couple of times as I scampered out the door. Then when I had the time to sew I was able to enjoyed practicing several motifs that I had learned over on Craftsy. My favorite is SQUARE DOODLE and horrors of horrors you cross lines. I practiced the motifs by drawing out the motifs on paper over and over again. I was trying to practice the ins and outs of the motif. 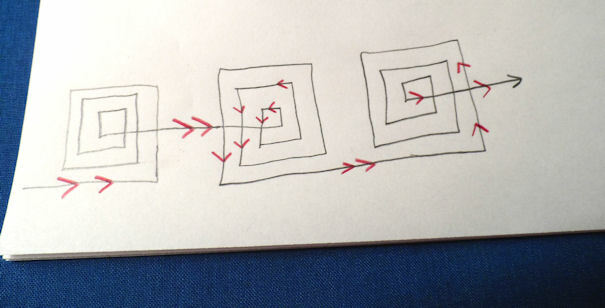 Even with the drawing practice my motifs were variable in placement, size, shape of the squares. They were kind of quirky and I am leaving them. I believe in doing the best that I can and in this time and place in my skill level this is where I am. I will not tear it out… besides I think they have a certain charm. Every FMQ instructor I have ever took classes from all mention the importance of doodling a motif over and over again to build muscle memory and to teach the quilter how to get in and out of tight spots. I doodled the motifs over and over again all sizes, all approaches. I really like this little motif and plan to use it again in the future. When I stitched out the border I did not even attempt to keep the size, shape or placement consistent. I am finding I have difficulty with the starts and stops and I tend to wiggle whenever I was trying to stitch a straight line. This is something I have to work on. .
What you do not see in these pictures is the markings. I could not find my marker box the only color marker I found was orange. I tested the marker on several scraps of fabric to make sure it would wash out, no problem. I had used CRAYOLA WASHABLE MARKERS several time to mark my quilt tops in the past but usually the softer colors. I also use the fine line markers and not the large markers. When I had finished FMQ this motif I found I could not stand to look at the bright orange markings I had used. So I gave it a little spritz… nothing. I spritzed the markings again and they remained. I then began to worry so I ran water in the wash tub just trying to soak only the area I had marked. The markings lighten but I could still see them easily. Panic … I ended up rubbing some laundry soap directly on the markings. I then drove to JoAnn’s Fabrics in town to get stain remover. I did not want to take any chances that I would not get the marking out. By the time I got home from my run to JoAnn’s the markings were gone. The kicker is I bought two new boxes of CRAYOLA WASHABLE FINE MARKERS and then found my box of markers. 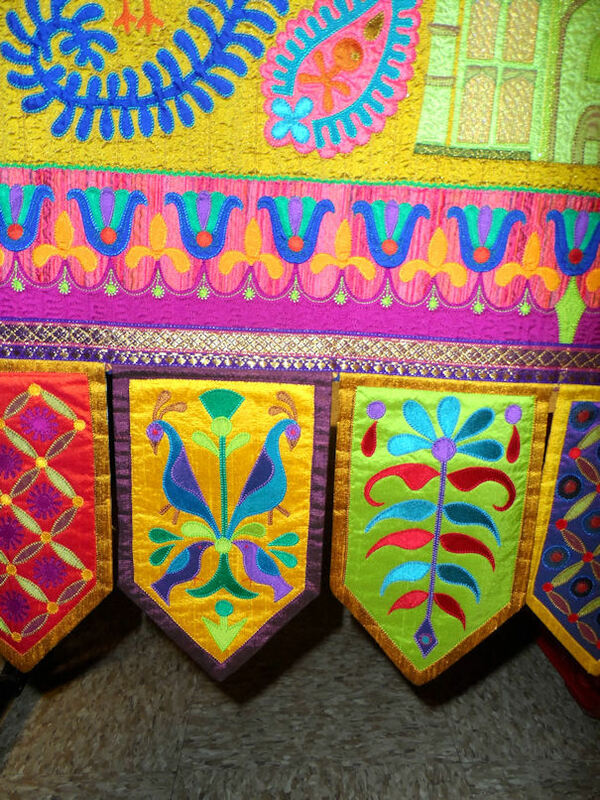 …..
1/ Sharon Schambers suggest starching the quilt top heavily. She uses cheap BIC mechanical pencils to mark the quilt. The markings sit on the starch protecting the fabric; they wash away when she blocks her quilt. I probably should have used more starch before marking the quilt. I also should have continued looking for my box of markers. If I had continued looking for a little longer I would have found my box and not had to use the large orange marker. As I have used this marking technique in the past and knew it worked well…. I SHOULD NOT HAVE PANICKED. 2/ I need to practice more, especially straight lines. I do not have good muscle control. When I stopped and then restarted, my stitching would jerk and I get a bobble in my stitch line. I also found had difficulty making nice sharp corners. That required me stopping then changing directions. I often got a slight bobble. Nothing that will not be covered up by the texture of the quilt after blocking and first wash, but I know they are the result of lack of control and skill, so I will continue with practice. I will be making more notations on what I learned but right now too tired to continue. Look for future edits. …. It is 3am so why am I awake???? It is 3 am (est) so why am I awake. My darling grandson had a night mare and woke up screaming. He is now sleeping the sleep of the unconscious but I am wide awake and can not go back to sleep.. BUMMER!! So I decided to journal my FMQ adventures because this is basically what this blog is about. This little baby quilt will go live in Arizona with my nephew, his wife and their expected daughter. If I want to remember the lessons I learn in this quilt I have to record them here because I will probably never see the quilt once it is gone. I was able to get some short quilting sessions in this week. 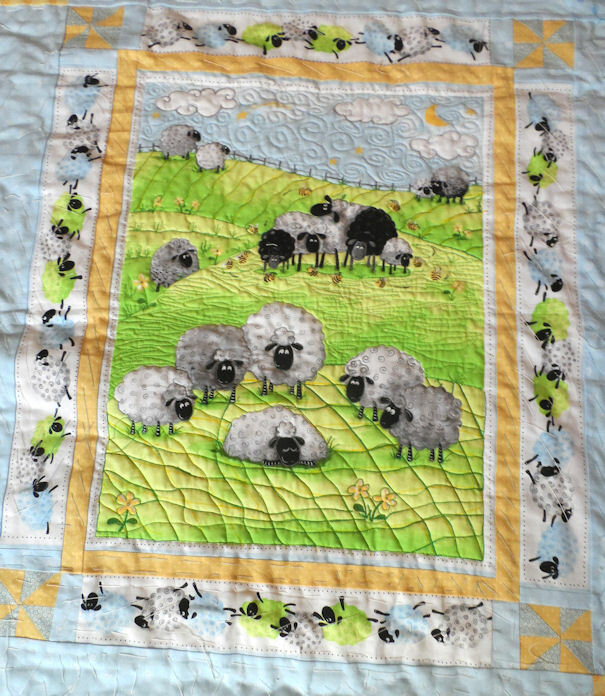 Each night after I came home and got some dinner on the table I was able to FMQ one of the small sheep borders. Each session was about a hour before getting ready for bed. I do not do my best quilting this late at night, but I have to do the quilting when I have some free time. I find working in small time frames get the work done; but it does have some draw backs. In this quilt I plan each border to have a slightly different motif, but if I wanted them all to be the same I would have some problems maintaining the same pattern in each border working the patterns on separate nights. Since I did a new pattern every night I did not have to worry about consistency. I wish I had placed a second layer of batting behind the little sheep as they would have looked very cute as a trupunto, but I opted not to do that. 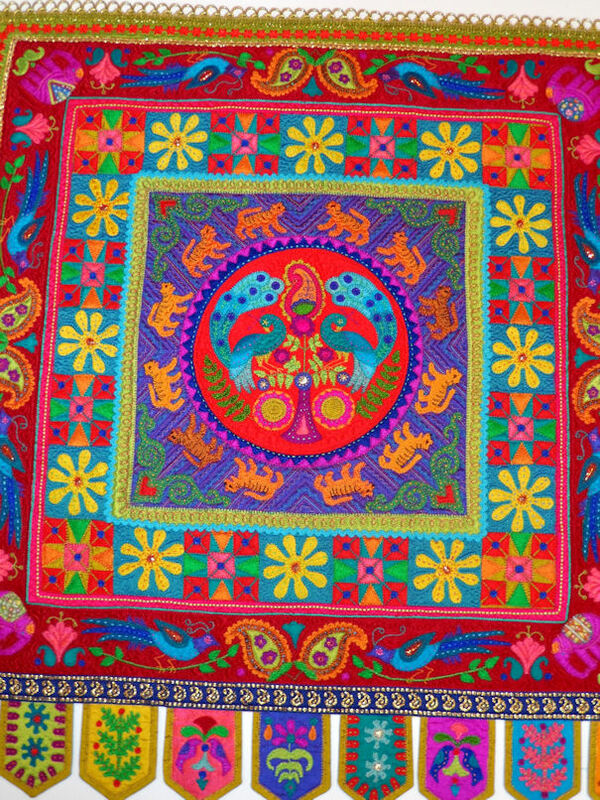 Each border has a slightly different FMQ motif in the background. Sewing in such a small scale was harder than I anticipated. My hands tended to cramp a little as I worked so I had to shake them out to loosen my grip. I had not noticed this problem when I worked on larger scale motifs. 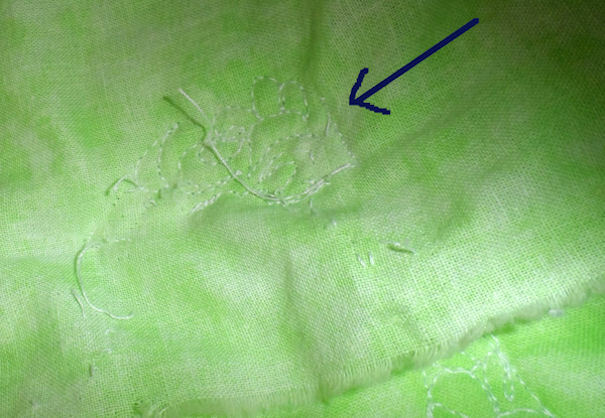 Small scale FMQ is more forgiving if you break pattern… I dare anyone to find my mistakes. The thin blending thread I chose to use makes it very hard to see errors. On my last night I made a major mistake in my FMQ resulting in me spending part of my time picking out the stitches. I now plan to pin my extra backing so I DO NOT sew it into my FMQ again. I have done this before… YOU WOULD THINK I WOULD LEARN FROM THE FIRST TIME. I will be journalling more as I finish each of the borders. I am thinking a different motif in each section. I hope you do not find it to boring but I want to write down what I have learned so I do not forget in the future. 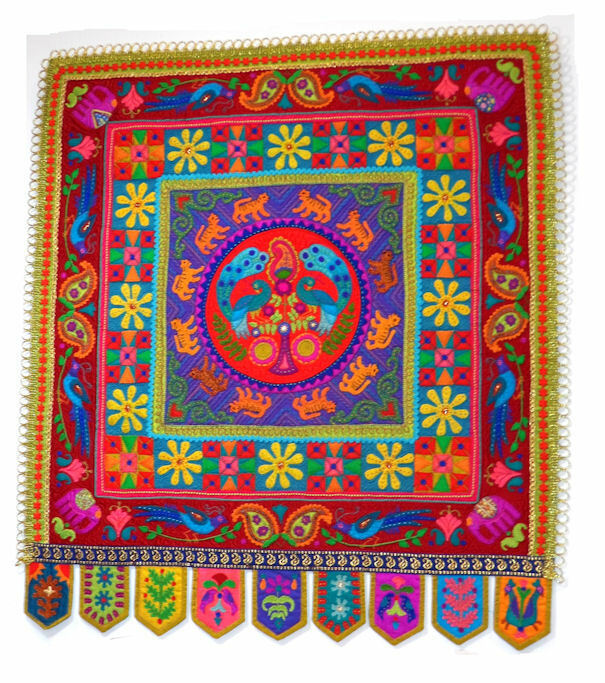 I have been scouting out various motifs on FMQ BLOGS mostly Leah Day and Angela Walters and of course PINTEREST. What would I do without PINTEREST? I can mimic FMQ patterns but I am not to the point that I can design my own… I need all the inspiration I can get. So sleep is finally coming to me. Here is my first set of small border pictures. Tomorrow I plan to do the larger borders. I have no idea at this time what patterns I will do. I hope everyone will stop by her blog and leave a comment welcoming her to the world of quilting podcasters. CAROLYN the BASHFUL BRITISH QUILTER has said she is in the process of fixing the email issues and getting a new address to publish. So keep checking the blog for updates. 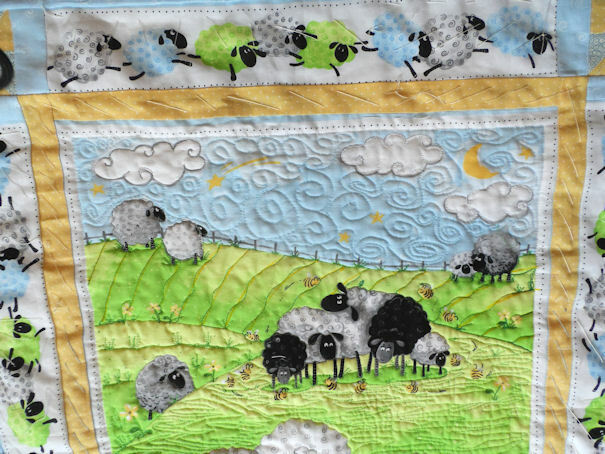 This is from my second session of FMQ on this sheep quilt. I used a french curve for the top panel and made gentle swoops. I was trying to mark them consistently but when I sewed them I strayed from the path. I only did one single pass using 40 wt King Tut thread. I was trying to mimic background hills. I originally tried to use a vertical flame pattern similar the horizontal flame pattern in the section above. I ended up picking out all the FMQ stitches. Thank goodness, there was less than a quarter of the section quilted. I then marked new lines in a curved grid pattern. I was having trouble following the lines without back tracking. As again I was using the 40wt King Tut thread,the back tracking showed, I kept getting bobbles and funky miss-stitches when I moved my hands. 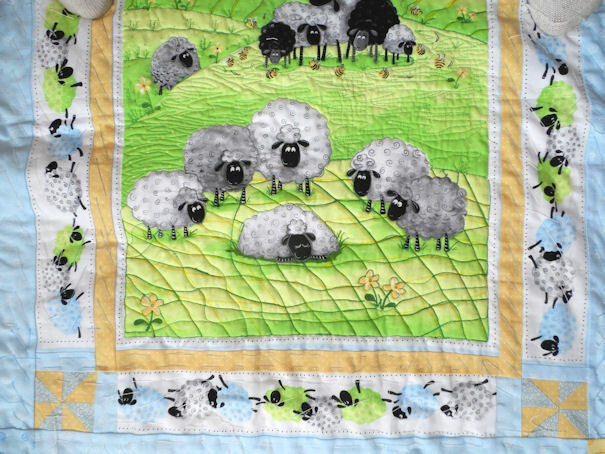 This would not win any prizes in a quilt show; but works great on a baby quilt. I find over quilting covers up a lot of mistakes and it looks like it was intentional. I do not think it would have looked so funky in the first place if I had used a thin thread such as bottom line, a 60 to 100 weight thread. Off I go for another FMQ session. I need to plan out what I am going to do in the multiple borders. One thing I know is I will only be using thin thread for the rest of the quilt. I am thinking of doing some of the motifs and patterns I learned through ANGELA WALTERS Craftsy classes and books. I will be posting them in the future.